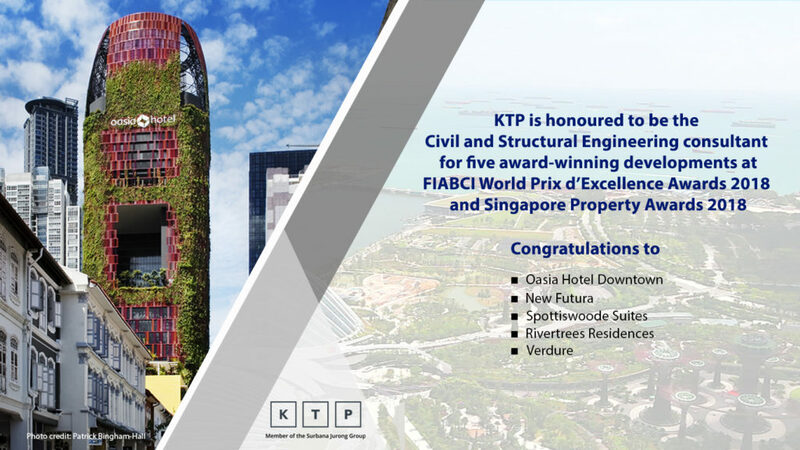 KTP, a member of the Surbana Jurong Group, is the Civil and Structural Engineering consultant behind five developments that picked up awards at the FIABCI World Prix d’Excellence Awards 2018 and Singapore Property Awards 2018. FIABCI, the French acronym for the International Real Estate Federation, is a worldwide network platform open to all professionals involved with the property industry, and represented by chapters in over 60 countries worldwide. Held annually by FIABCI-Singapore, the award ceremony comprises the FIABCI World Prix d’Excellence, an international benchmark of excellence in all real-estate-related disciplines such as development and construction, and Singapore Property Awards, the local chapter that promotes excellence in design and architecture. As one of the largest Asia-based urban and infrastructure consultancies, Surbana Jurong Group will continue in its commitment to deliver high-quality work and engineering excellence, and contributing to its clients’ breakthrough successes. Verdure – Bukit Sembawang Estates Pte Ltd, Winner for Residential (Low Rise) Category.